You are currently browsing the tag archive for the ‘vinegar’ tag. 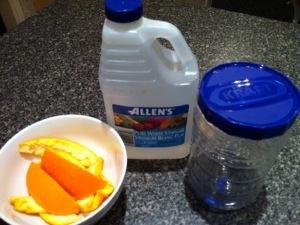 I have been noticing a lot of homemade orange cleaner recipes popping up all over the internet and since I already had the ingredients on hand, I figured I’d try my hand at it. What’s the worst that could happen, it doesn’t work & I have to toss it? I’d only be tossing pennies away. Yes. I know they do add up but if this cleaner works – I will be saving a lot more pennies having tried this lil science experiment and slowly replacing store bought cleaners with this thus saving me a small fortune! This needs to sit for two weeks minimum in order to create the yummy smelling magic. Give the jar a good shake once a day. Apparently the vinegar smell disappears and all that’s left is the awesome orange scent. We’ll see. Is it so wrong that I’m giddy with glee with anticipation? At the end of two weeks, pour the vinegar mixture through a strainer into a spray bottle. You can either use it at full 100% strength for tough/stubborn messes OR mix with water with a 1:1 ratio. You can use this anywhere where you’d normally use a vinegar cleaner. Apparently you can re-use the rinds two more times and achieve the same effects but the colour won’t be as strong. So, I have my jar of rinds going and will report back in about two weeks with my findings and review once I’ve started using it. I can’t wait!! 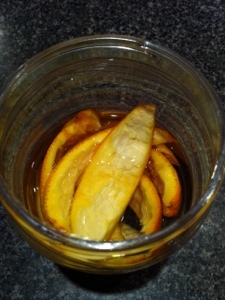 So tell me, have you ever tried making your own citrus cleaner? How’d it turn out? 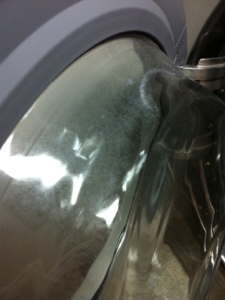 Lately, I’ve started to notice a not so subtle white film starting to appear on the door of the HE washer. Having an idea of what it is but not quite sure how to really get rid of it, I let it stay and continue to build up. When it turned into this (see pics below) I decided it was time to take action. It’s kind of hard to see but its on the outer ring on the glass portion of the door. So besides doing the obvious – cleaning it, I took the time to do a quick Google search. Apparently its laundry detergent residue. And its totally natural for this to occur. Common causes of residue build up: too much detergent, constant cold water washing, use of non-HE detergent to name a few. While being guilty of using non HE detergent from time to time, I always make my final wash of the day a load of towels using HE detergent on the EXTRA HOT setting. Suggested ways to help get rid of the residue – run a hot wash cycle with a HE cleaning product. Wait, what? You want me to wash soap with more soap? Not being happy with that answer nor being willing to fall victim to some marketing ploy, I decided to look for alternate solutions. You could run 3-4 empty hot wash cycles with vinegar, then bleach, then nothing to give the machine a good rinsing. Waste of water and electricity if you ask me. None of these seemed ideal for me. I mean my machine doesn’t have an odd ‘odour’ as mentioned while Googling. And my clothes didn’t come out with any funky or musty smells. Another tip for those of you that do have a problem with the smell: after your last load, leave the door to the washer open for at least 24hrs so it can dry out. Same thing with the lil laundry compartment door. Instead, what I chose to do was give the glass portion of the door as well as the rubber seal (and underneath the rim) a good wiping with straight vinegar while also inspecting under the rubber rim for foreign objects and mold. Both of which I am happy to report that I had neither. Not impressed with the results, I gave it another go with MUCH more (and very unmentioned) elbow grease. Still wasn’t happy. 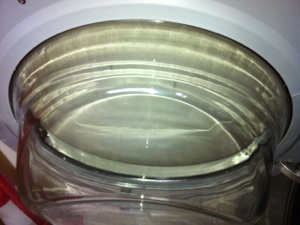 I decided to bust out my method all purpose spray cleaner – great for cutting grease & grime – and voila! 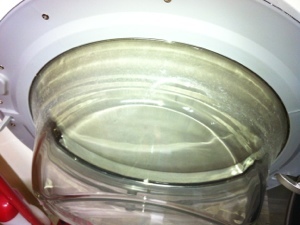 We had a clean glass door and a very clean smelling washing machine. Look at how clean that puppy is! 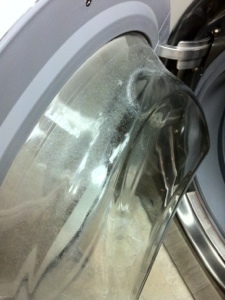 Has anyone else ever experienced this film/residue issue with their HE washer? How often do you clean your washing machine?